Celebrate “Star Wars” Day with some geeky goodies, such as Pretzel Lightsabers. 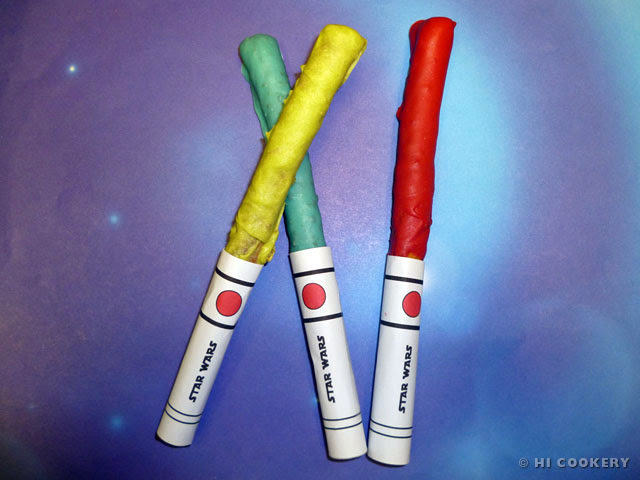 They are quick and easy to make and are popular playthings at parties with a “Star Wars” theme. 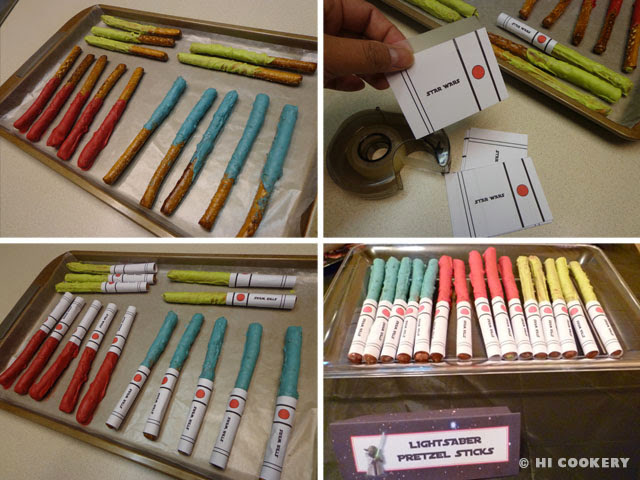 Simply dip pretzel sticks/rods into colored candy melts, let set and wrap in our lightsaber labels (PDF provided in this post!). May the Force be with you on May the 4th!!! In a tall container, such as Wilton’s dipping box, microwave candy melts according to the package directions. Or microwave candy melts and pour into tall glasses for easier dipping. 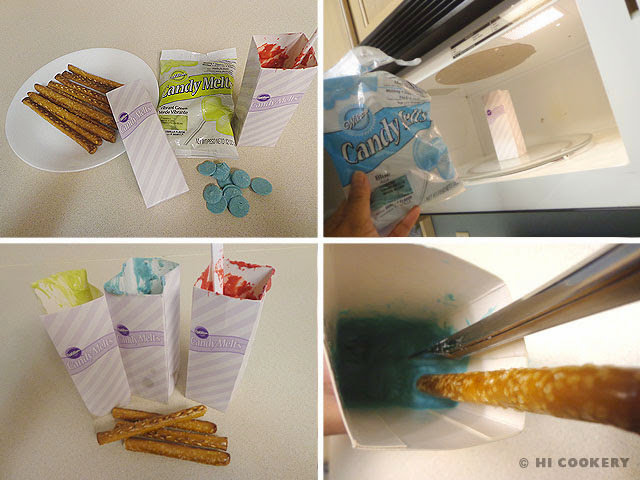 Dip the pretzel sticks/rods ¾ deep into the candy melts, coating well. Set onto a baking sheet lined with waxed paper. Refrigerate to set. Remove from the baking sheet. Print out our lightsaber labels HERE (set color printer options and resize as necessary). Cut and wrap around the non-coated end of the pretzel sticks/rods. Use transparent tape to secure the edges. Set the pretzel lightsabers on a decorative tray and serve. Add a little vegetable shortening to the candy melts to give it a thinner dipping consistency. Sprinkle matching colored sugar on the coated pretzels after dipping to give them a little “Star Wars” sparkle (optional). Search our blog for other “Star Wars” themed foods, such as Yoda Soda, Princess Leia’s Danish ‘Do’s, Wookieee Cookies, etc. Aloha! I am from Ewa Beach and I was looking for Hawaiian recipes when I stumbled on your blog. I’ve been missing the islands so I thought I’d cook some HI recipes. Will be visiting your blog again :). Mahalo for the recipes. OMG–Ewa Beach is my hometown and I miss Hawaii so much, too. Blessings on your health. Thanks for visiting our blog!